Work to upgrade Rotorua’s mountain bike carpark at Waipa has started. The carpark will receive a full upgrade during the next four months, starting 25 July, including new kerbing, sealing and landscaping. 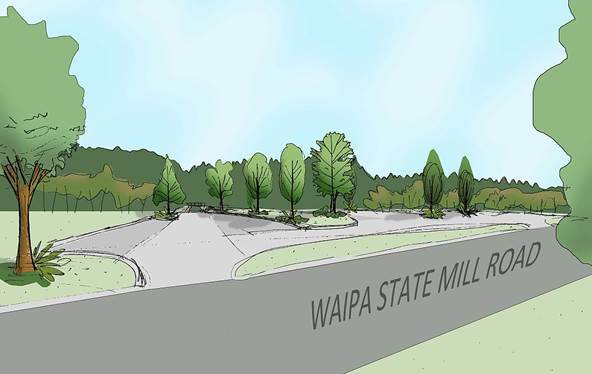 In response to community requests for investment into this popular recreation area, Council has committed to a 10-year revitalisation plan for Waipa in the Long-term Plan adopted in June 2015. The plan allows for funding of $1.08 million to be spent on the area during the next 10 years. The carpark that is adjacent to the new toilet facilities will be closed from 25 July until early October while the improvement work is underway but users will be able to park in the first paddock off Waipa Mill Road, an area normally used for overflow parking or as an events space. Mountain Bike Rotorua’s rental service and café will also relocate to the paddock for the duration of the carpark closure. People will still be able to access the toilet and shower facilities. The former Waipa Village site, on the opposite side of the road, has been made available by Red Stag for managed overflow parking for events scheduled during this time. Sports and Recreation manager, Rob Pitketheley says the upgraded carpark will meet the needs of all forest users. “Rotorua is known for its world class mountain bike tracks and outdoor activities. They attract thousands of locals and domestic and international visitors each year. Ensuring our open spaces provide the appropriate level of service is a top priority for Council. “The current gravel carpark is functional but dust becomes a significant issue at times and ongoing maintenance is required to keep the gravel surface up to standard. A sealed carpark will require less maintenance and will meet the high standard that our world class trails deserve,’’ he said. Landscaping is planned for around the carpark. How many parking spaces will be available by next February 2017? Wondering if we we easily get a parking space if we arrived mid day for a tree top walking break before heading to lake Taupo. Will it be a secure car park (attendant) if we leave luggage in the car? Hi, if you are wanting to do the Tree Walk you will want to park at the main Redwoods car park which is on Long Mile Road. This development is on the other side of the forest. If you go back into the website and under the home tab there is a ‘how to get there’ link. This will give you directions and a google map. There is plenty of parking, although February is one of the busiest months. The main car park has a security camera but like any public parking areas you should stow your luggage in the boot rather than in the main car where it is visible to remove any temptation. The Tree Walk is great! Hope you enjoy your visit.